On iPad or iPhone, there is a Facebook account which you can set as the default such that any app that uses Facebook account to log in will use the default Facebook account to do so. This default Facebook account setting can be accessed via the Facebook option in Settings menu. Naturally whenever you start your Candy Crush game, the default Facebook account will be used to sign in. If the iPad/iPhone is a borrowed one, you would need to change the default Facebook account to yours in order to use your own Facebook account to play Candy Crush and continue your own progress. It makes things easier if the original iPad/iPhone owner does not play Candy Crush as you can change the default Facebook account to yours, log in to Candy Crush game, then go back to the settings and change it back to the owner's Facebook account. If you miss this step, should anyone using this iPad/iPhone log in to any app via Facebook, the account used will be yours. If you don't wish for your Facebook privacy (or whatever that's left of it) to be compromised in other apps, make sure you change the default Facebook account back to the original Facebook account! If not, the next person could access your instagram account for example or sign-in to a new app using your Facebook account. First of all, before you proceed, you should seek the rightful owner's permission to allow you to change the Facebook account from the device - this is basic courtesy. Then you need to log out the previous user from Candy Crush Saga. 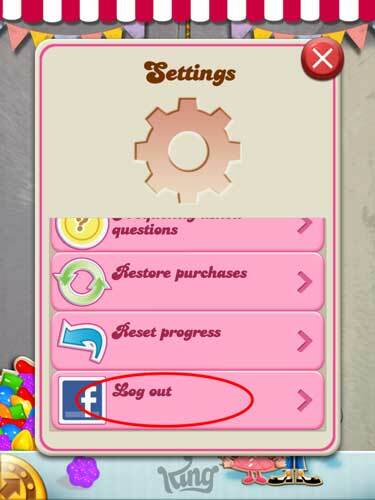 Go to the golden arrow on the bottom left of Candy Crush start screen and choose Log Out where you see the Facebook logo. If Candy Crush is not installed yet, go on to the following steps before installing the Candy Crush app (you would need the owner's Apple ID and password to install an app on a device that is not under your Apple ID). Next go to settings of your iPad or iPad mini and find the facebook icon. Tap on the name, which is probably the owner's Facebook account. Another window will appear like on picture 2, tap on Delete Account red button to log out the facebook account the currently log on on the iPad. A new window will appear, choose Delete Account. After you finish to logout, you will be redirected to window where you can log in your facebook account, just sign in with your own Facebook account. Under the "Allow These Apps to Use Your Account", select "OFF" for all of them if you are not the main user of this iPad or iPhone, otherwise your contacts, calendar details will appear on this device. Now install Candy Crush game if it is not yet done so. If Candy Crush is already installed, go back to the Candy Crush Saga app and start it up to connect to facebook account, which should be the one you have just changed into in the above steps. Once started, you should see your progress in the game. Take note that if you had been playing Candy Crush using another Facebook account, you will not see where you left off because Candy Crush track progress based on Facebook account - it is important that you log in with the account which you have been using to play Candy Crush all this while. If you still see the previous Facebook account in Candy Crush, try to reboot the device and log in to Candy Crush again. Now, if you need to return the iPad or iPhone back to the original owner, remember to go back all the way to the first step to log your own account out from Candy Crush and to remove your Facebook account as the default Facebook account on this iPad or iPhone. If this is a shared iOS device and you will still continue to play Candy Crush on it, then do not log out from Candy Crush, just change the default Facebook account in iOS settings. Then you can still continue to play Candy Crush using your Facebook account while the default Facebook account for other purposes remains that of the owner's.